The park is a great place for birds. Over 60 different bird species can be seen in a year and 46 species have been recorded as breeding. A list of birds that have been recorded over the last century has been compiled by Ian Bennell, whose is the Friends of Cassiobury Park Bird Recorder. Ian is a Herts Bird Club committee member and regular bird watcher in Cassiobury Park. He keeps a blog about his latest sightings which can be found at ianbennellsbirdingblog.blogspot.com. 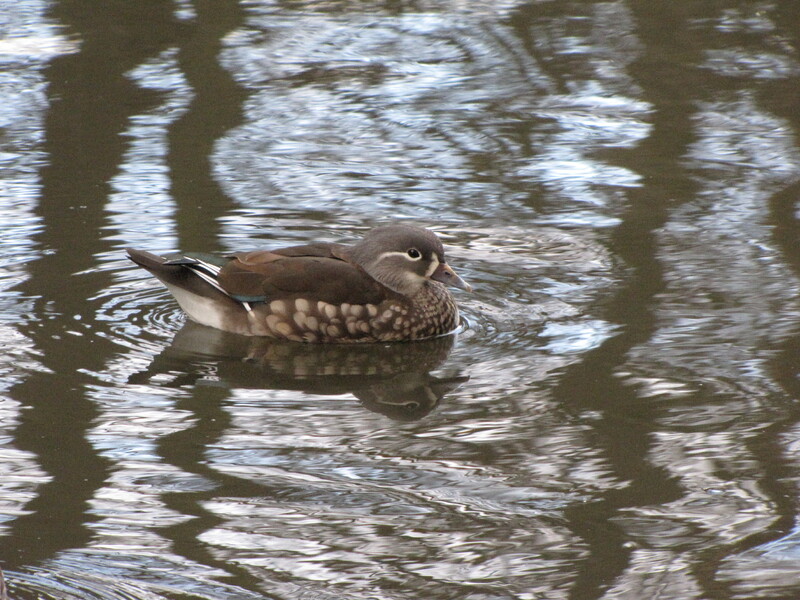 Female Mandarin Duck near the main lock in January and still there on 5 Feb 12. Please send your sightings to Ian at : cassioburybirds@hotmail.co.uk and anything ‘special’ to the Herts Bird Club and the Cassiobury Park Bird Club. Parakeets in the park. We are all now getting acquainted with Ring-knecked Parakeets in the park – startlingly attractive new birds which may or may not be threatening our native species. At the AGM in 2011 we heard a very informative talk on the parakeets by Hannah Peck, who is carrying out PhD research on the invasive ecology of the Ring-necked Parakeet in the UK. She is something of an expert on the subject and updated us with the latest knowledge of this extraordinarily successful species. ParakeetNewsletterAug2011.